Like the prow of a ship, the Granite Mountains rise sharply from the creamy-white playa of the Black Rock Desert in Nevada. Here, in rugged terrain owned by the American public, a little-known federal agency called Wildlife Services has waged an eight-year war against predators to try to help an iconic Western big-game species: mule deer. With rifles, snares and aerial gunning, employees have killed 967 coyotes and 45 mountain lions at a cost of about $550,000. But like a mirage, the dream of protecting deer by killing predators has not materialized. “It didn’t make a difference,” said Kelley Stewart, a large-mammal ecologist at the University of Nevada, Reno. Now such killing is coming under fire from scientists, former employees and others who say it often doesn’t work and can set off a chain reaction of unintended, often negative consequences. In biological shorthand: Kill too many coyotes and you open a Pandora’s box of disease-carrying rodents, meadow-munching rabbits, bird-eating feral cats, and, over time, smarter, more abundant coyotes. You also can sentence the deer you are trying to help to slow death by starvation. Killing predators is part of Wildlife Services’ DNA, a mission it pursues – along with a wide range of other animal control work – largely outside public view. Some details, though, can be gleaned from the agency’s Web page, where it posts a sea of data showing – species by species – the millions of birds and mammals its employees kill each year. Sift through the numbers and you find that about 560,000 predators were killed across America from 2006 to 2011, an average of 256 a day. “If you look at their mandate, we could not have written it better for them,” said Suzanne Stone, Northern Rockies representative for Defenders of Wildlife, who has worked with Wildlife Services employees to promote nonlethal control. “It’s all about supporting wildlife conservation and promoting humane tools. But tracking the ecological effects of predators is a fine art not widely practiced. “We could sure use more research,” said Barrett. Last year, something curious caught Stewart’s attention in Nevada: an email informing her that a mule deer had tested positive for the plague – a disease sparked by rodent outbreaks and potentially deadly to humans – in an area where Wildlife Services was killing predators. “I was irate,” said Hoots. “It was the dead of winter, and I found no reason for them to be shooting because the coyotes weren’t bothering anything. Aerial gunning is the agency’s most popular predator-killing tool. Since 2001, more than 340,000 coyotes have been gunned down from planes and helicopters across 16 Western states, including California – an average of 600 a week, agency records show. “When they take that plane up, they kill every single coyote they can,” said Strader, the former Wildlife Services hunter who worked with aerial gunning crews in Nevada. “If they come back and say, ‘We only killed three coyotes,’ they are not very happy. If they come back and say, ‘Oh, we killed a hundred coyotes,’ they’re very happy. Clay, the agency’s deputy administrator, defended the practice, calling it is a valuable preventive strategy to clear swaths of land of predators in the winter before livestock arrive to graze in the spring. “If you can remove the predators, you can reduce the losses,” Clay said. “It absolutely calls for a cost-benefit study,” said Niemeyer. “Aerial gunning is very, very expensive. You are talking $700 to $1,000 an hour to be hunting these coyotes. The practice remains popular, he said, because it keeps hunters busy during the slow winter months. “These guys don’t have a heck of a lot to do in the winter, so to stay employed, they need to go fly around in a helicopter and shoot coyotes that might kill a sheep next spring,” Niemeyer said. “A lot of it comes down to nutrition and competition. When you have fewer animals (coyotes) on the landscape, you have more food available per individual. There is a ton of food on the landscape. Why not have a bigger litter?” said Stewart, the Nevada ecologist. Sheep and lambs are most at risk. “They are easy to kill, and lots of animals key on them,” Niemeyer said. Niemeyer is not the only former Wildlife Services employee to raise questions about agency practices. In California, biologist Mike Jaeger did, too, with studies in Mendocino County that showed most coyotes don’t prey on sheep at all and those that do are the hardest to kill with nonselective traps and poison. But his calls for more selective control often went unheeded, he said, because of a disconnect between the agency’s scientific and field personnel – and its close ties to the livestock industry, which helps fund predator control. The email by a Nevada Department of Wildlife biologist details work on the 3,200-acre Rafter 7 Ranch on the East Walker River in Nevada. “With no evidence of any kind that any predation had occurred Wildlife Services set snares around the area to kill any predators that may wander through,” the biologist, Russell Woolstenhulme, wrote. The state is now demanding that Wildlife Services target predators more selectively. “We realize some of this stuff is not publicly acceptable,” said Rob Buonamici, chief game warden for the Nevada Department of Wildlife. In some cases, animals had rotted away by the time the agency hunter found them. “Only the skull was saved due to decay. Pelt not saved due to decay/slippage. Decomposition did not allow for accurate weight estimate,” he wrote in a series of reports about mountain lions. In 2009, the hunter found two lions dead in snares close to each other, “most likely” a mother and daughter, he wrote. Coyotes were targeted routinely, including four pups killed in their den in May 2011. Has the killing been worth it? That is what scientists have asked as they’ve flown over the Granites, comparing the size and growth of deer herds where predators were killed with places where they were not. The scientists have packaged their data and findings into reports and presentations filled with biological jargon and complex statistical analysis. But in plain English, it hasn’t worked. A recent study in “Wildlife Monographs,” a scientific journal published by the Wildlife Society, reported that most years, coyotes don’t prey on deer at all. They’re busy eating mice and rabbits. And even when a coyote does kill a mule deer, it generally doesn’t have an impact. “There is a contingent of mule deer that are going to die every year anyway. Often those are the first ones coyotes prey on,” said Mark Hurley, a mule-deer biologist with the Idaho Department of Fish and Game and author of the study. On occasion, Wasley has presented his findings to Wildlife Services managers in Reno. “I’ve been told my analysis is a morale breaker, that they don’t like me because I’m doing objective analysis,” he said. “The director told me he’s got a tough time keeping his guys’ spirits up when they read what they’re doing has yet to demonstrate any measurable benefit,” Wasley said. Much of the degradation of soils in the urban environments that have prairie dog colonies is the result of considerable human disturbance over long periods of time. The soil erosion we tend to see is often due to overgrazing by cattle, which has been well demonstrated by numerous studies (Schlesinger et al. 1990, Van Auken 2000, Reynolds et al. 2007). It is important to keep in mind that black-tailed prairie dogs prefer open patches of grassland, and will move into heavily grazed patches of grassland. This tends to cause the observer to blame the prairie dogs for the degraded state, when in fact the conditions were present prior to the presence of prairie dogs. Prairie dogs and bison co-existed for thousands of years throughout the central grasslands of North America (Forrest 2005, Miller et al. 2007). Current research at Janos, Mexico by researchers at the University of New Mexico and University of Mexico (Davidson et al., unpublished data) involves an exclosure experiment where they are comparing grassland in areas where prairie dogs are present to where they have been removed. The effects of prairie dogs on soil stability (a measure of soil erosion) are measured for this study, which shows absolutely no difference (statistically or even qualitatively) in soil stability where prairie dogs are absent versus where they are present over the 2 years (4 seasons) of the study. Prairie dog burrows act as aquifers that prevent water from eroding land while helping to cool it. Recent studies have shown that ‘managed’ grasses and forbs atop a prairie dog town are higher in protein and nitrogen and are favored for grazing by bison, elk, and pronghorn. a [Prairie dog] burrowing can be beneficial to the soil because mixing soil types and incorporating organic matter enhances soil formation. It also helps to increase soil aeration and decrease compaction. In short-grass prairies, the number of plant species, particularly forbs, increases because of the digging and scratching activities of prairie dogs that disturb the soil. These patches of bare soil provide excellent sites for annual forbs to become established. . . . Long-term use of an area by prairie dogs appears to promote buffalograss and grama grasses (Foster & Hygnstrom). Prairie dogs do more than just serve as prey, they also perform a valuable service for the prairie – they disturb it. In addition to digging up the soil, prairie dogs clip the vegetation around their burrows, enhancing nitrogen uptake by these plants. Natural disturbances are an important part of maintaining the prairie ecosystem (Kotliar, 2001). The overgrazed conditions that we see when both prairie dogs and cattle co-occur are largely due to cattle being confined to a fenced landscape that no longer reflects the large roaming herds that historically grazed the grasslands. Large ungulates are known to preferentially graze on prairie dog colonies because of the more nutritious forage (Whicker and Detling 1988, Miller et al. 2007). This is a counterintuitive phenomenon made logical by the prairie dog’s penchant for clearing shrubs that cattle shun, while stimulating weeds they savor (Stolzenburg, 2004). Widespread soil erosion is largely caused by overgrazing by cattle, and prairie dogs are known to move into the overgrazed grassland patches. Prairie dogs from urban populations provide a key source of prairie dogs for grassland conservation and restoration. Like giant earthworms, their excavations were loosening and turning, fertilizing and aerating nearly six tons of hard-baked desert soils per acre, more than eight times the combined output of all kangaroo rats, badgers and other burrowing mammals of the grasslands (Stolzenburg, 2004). Efforts to simply eradicate prairie dogs from urban areas are short-sighted and do not contribute to the conservation of our native grassland ecosystems. Extermination efforts require 72 hours of poisoning to kill the animals. It is an extremely long, inhumane death, and is not something that should be condoned in a civil society. Additionally, extermination efforts indiscriminately kill not only prairie dogs but also other native wildlife. A model way to think about prairie restoration would be to utilize displaced urban prairie dog populations as a source to repopulate grassland areas being restored for prairie wildlife. In these restoration areas, animals can be released so they can repopulate areas where they were historically abundant, prior to mass extermination efforts and play their keystone role in grassland ecosystems, which is critical to maintaining grassland biodiversity. Forrest, S. 2005. Getting the story right: a response to Vermeire and Colleagues. Bioscience 55:526-530. Schlesinger, W. H., J. F. Reynolds, G. L. Cunningham, L. F. Huenneke, W. M. Jarrell, R. A. Virginia, and W. G. Whitford. 1990. Biological feedbacks in global desertification. Science 247:1043-1048. Stolzenburg, W. 2004. Nature Conservancy, Understanding the Underdog.pp 28-31. Whicker, A. D., and J. K. Detling. 1988. Ecological consequences of prairie dog disturbances: prairie dogs alter grassland patch structure, nutrient cycling, and feeding-site selection by other herbivores. Bioscience 38:778-785. Van Auken, O. W. 2000. Shrub invasions of North American semiarid grasslands. Annual Review of Ecology and Systematics 31:197-215. Although there is tremendous documentation of the benefits that prairie dogs provide to wildlife species, both as a prey base and for creating extensive habitat for prairie creatures, it is also important to recognize that prairie dogs may help to redress the damage to the land caused by reckless humanity. First, prairie dogs act as water conservationists. While humans have devastated the water features of the Great Plains –by damming up rivers and streams for crop and livestock agriculture, and by overgrazing of riparian areas by livestock– prairie dogs increase the ability of an arid region to conserve what little water falls from the sky. One author (Outwater 1996) has remarked on the extensive megapore system prairie dogs can provide for channeling precipitation into the water table. Imagine 100-700 million acres of these megapores diligently directing the scant Great Plains rainfall to underground storage. Imagine also what the reduction of those millions of acres to less than 700,000 acres might mean in terms of increased flooding (where there isn’t meant to be flooding) and increased runoff in general. In addition, prairie dog clipping and digging activities lead to decreases in transpiring leaf area, conservation of soil moisture, changes in soil physical properties, and the promotion of water infiltration to deeper soil depths. All of these factors probably account for the improved soil moisture availability and plant water status on prairie dog colonies (Day and Detling 1994). This improved water status and the higher ratio of green forage on colonies later in the season may explain preferential grazing by bison and antelope (Day and Detling 1994), and, of course, by domestic cattle. In other words, prairie dogs increase the ability of the soil and vegetation in the arid Great Plains to conserve the region’s scant precipitation. Prairie dogs might also redress some of the problems with overgrazing. For instance, prairie dogs can control noxious weeds and native invaders which proliferate on overgrazed rangeland. An example is prairie dog control of mesquite (Miller et al. 1996; Miller and Ceballos 1994). They remove pods and seeds and nip and strip bark from young seedlings, which contributes to seedling mortality. The extermination of the prairie dog may therefore explain the proliferation of honey mesquite from the late 19th century (“Suffering From a Prairie-Dog Shortage,” 1991). Where mesquite proliferates, prairie dogs could serve to control it. Finally, prairie dogs may also reverse processes such as soil compaction caused by cattle grazing. For example, Ellison and Aldous (1952) provide an early report of the soil aeration effected by burrowing rodents. These rodents produce soil which is substantially softer and looser than soil in uncolonized areas. Such rodents consequently represent a range improvement, which can undo some negative effects on rangeland (e.g. soil compaction) that are caused by domestic cattle. Many of the earlier studies (e.g. Reading/Miller/Whicker/Detling) have been very clear that the biodiversity contributions of prairie dog colonies should be perceived in terms of a grassland mosaic – e.g. a mix of colonized and uncolonized areas, colonized for different lengths of time. If one looks at biodiversity that way, it makes good sense to observe species near or flying over a prairie dog colony, as well as those species on a colony. Prairie dog colonies don’t operate in isolation from uncolonized areas, so why should their value to biodiversity levels/associated wildlife be judged in isolation? Landscape-level dynamics should be judged at the landscape-level, not acre by acre. 1. Black-footed ferret. This species is an obligate associate of the prairie dogs (Russell et al. 1994). Black-footed ferrets depend on prairie dogs as a primary food source and upon their burrows for shelter from weather and predation. The ferret is completely dependent upon prairie dogs for survival (Henderson et al. 1969). Prairie dogs constitute about 90% of the ferret’s diet. 2. Swift Fox. A major portion of the swift fox diet is prairie dogs (Uresk and Sharps 1986). Also of importance is the ability of prairie dogs to provide cover for swift fox. Swift foxes den on or within .8km of prairie dog colonies (Hillman and Sharps 1978). 3. Ferruginous Hawk. That the ferruginous hawk is closely associated with prairie dogs is apparent from research which suggests that ground squirrels and prairie dogs are the top food source for the ferruginous hawk (Olendorff 1993). In addition, researchers have reported the ferruginous hawk’s relative abundance in areas with prairie dog acreage (Knowles and Knowles 1994; Cully 1991), and Canada has emphasized the importance of prairie dogs and burrowing mammals associated with prairie dog colonies in the recovery of ferruginous hawk populations (Canadian Ferruginous Hawk Recovery Plan 1994). 4. Mountain Plover. The mountain plover may be a prairie dog obligate (Knowles and Knowles 1994), and is, at minimum, highly dependent on prairie dogs for survival. Knowles and Knowles (1998) report that mountain plovers select prairie dog colonies for nesting, breeding and feeding. Other reports concur, showing, for example, that mountain plovers use prairie dog towns as nest sites (BLM 1979, cited in Clark et al. 1982), and they strongly prefer the short-cropped vegetation on prairie dog towns (Knowles et al. 1982), which facilitates their insectivorous feeding (Olson 1985). 5. Burrowing Owl. Prairie dog colonies provide the burrowing owl with both shelter and increased prey abundance (Agnew et al. 1987). Consequently, the decline in prairie dog habitat causes declines in burrowing owl numbers (Knowles and Knowles 1994). 6. Golden Eagle. The golden eagle has long been described as an important prairie dog predator, with current predation probably “second only to badger predation” (Campbell and Clark 1981, 273). More recent reports echo the importance of the golden eagle as a prairie dog predator (Hanson 1993), with some researchers declaring that, in the Northern Great Plains, “wherever prairie dogs are found, golden eagles can also be found” (Knowles and Knowles 1994, 35). When golden eagles nest near prairie dog towns, prairie dogs comprise 50-62% of their diet (Tyus and Lockhart 1979). 7. Badger. Badgers are commonly associated with prairie dog colonies. Knowles and Knowles (1994) write “Generally, the more abundant prairie dogs are in an area, the greater the chances of encountering badgers.” According to Campbell and Clark (1981), badgers are possibly the most significant predator of prairie dogs. Lindzey (1982) concurs. 8. Coyote. Coyotes have been named as important predators of prairie dogs by some researchers (Tyler 1968; Koford 1958; Longhurst 1944; Sperry 1941). 9. Prairie Falcons. One researcher reported the majority of predation on prairie dogs was done by prairie falcons (Knowles 1982). Knowles and Knowles (1994) expect that, should good nesting habitat exist for prairie falcons near prairie dog towns, a significant portion of the falcons diets would be prairie dog. 10. Bison. The preference of bison (buffalo) for grazing, breeding, and resting in prairie dog towns has been demonstrated by other researchers (Whicker and Detling 1993; Coppock et al. 1983b). Even more interesting, Krueger (1986) found that bison and prairie dogs have a mutually positive relationship, as the foraging efficiency of prairie dogs increases in the presence of bison, and bison, in turn, prefer the vegetative conditions caused by prairie dogs. 11. Pronghorn. This ungulates preferentially grazes on prairie dog colonies, on account of the abundance of forbs that typify colonized areas (Whicker and Detling 1993; Krueger 1986; Wydeven and Dahlgren 1985). 12. Elk. This ungulate preferentially grazes on prairie dog colonies in the summer months (Wydeven and Dahlgren 1985). 13. Mule deer. This ungulate also preferentially grazes on prairie dog colonies (Foster and Hyngstrom, n.d.). 14. Horned Lark. This bird has been reported to be found in higher abundance on prairie dog colonies than in surrounding mixed-grass prairie (Agnew et al. 1986). 15. Mourning Dove. This bird has been reported to be found in higher abundance on prairie dog colonies than in surrounding mixed-grass prairie (Agnew et al. 1986; Clark et al. 1982). 16. Killdeer. This bird has been reported to be found in higher abundance on prairie dog colonies than in surrounding mixed-grass prairie (Agnew et al. 1986; Clark et al. 1982). 17. Barn Swallow. This bird has been reported to be found in higher abundance on prairie dog colonies than in surrounding mixed-grass prairie (Agnew et al. 1986). 18. Long-billed Curlew. Prairie dog colonies are reported to benefit this bird (Clark et al. 1982; BLM 1979). 19. Eastern Kingbird. Prairie dog colonies are reported to benefit this bird (Clark et al. 1982; BLM 1979). 20. Upland Sandpiper. Prairie dog colonies are reported to benefit this bird (Clark et al. 1982; BLM 1979). 21. McCowns Longspur. Prairie dog colonies are reported to provide nest sites for this bird (Clark et al. 1982; BLM 1979). 22. Snowy Owl. This bird has been documented utilizing prairie dog colonies in the winter months (Sharps and Uresk 1990). 23. Bald Eagle. This bird has been documented utilizing prairie dog colonies in the winter months (Sharps and Uresk 1990), as prairie dogs can provide a portion of this birds diet (City of Boulder, CO, Open Space Dept. 1996). 25. Kestrel. This bird has been documented utilizing prairie dog colonies in the spring, summer and fall months (Clark et al. 1982). 26. Rough-legged Hawk. This bird has been documented utilizing prairie dog colonies in the spring, summer and fall months (Clark et al. 1982). 27. Harrier. This bird has been documented utilizing prairie dog colonies in the spring, summer and fall months (Clark et al. 1982), as prairie dogs can provide a portion of this bird’s diet (City of Boulder, CO, Open Space Dept. 1996). 28. Short-eared Owl. This bird has been documented utilizing prairie dog colonies in the spring, summer and fall months (Clark et al. 1982). 29. Deer Mouse. This small mammal has been reported to be found in higher abundance on prairie dog colonies than in surrounding mixed-grass prairie (Agnew et al. 1986). 30. Northern Grasshopper Mouse. This small mammal has been reported to be found in higher abundance on prairie dog colonies than in surrounding mixed-grass prairie (Agnew et al. 1986). colony, in contrast with .03-.05/ha off-colony. (Hansen and Gold 1977). 32. Prairie rattlesnake. The greater abundance of small mammals in prairie dog colonies (Agnew et al. 1986), and the availability of prairie dog burrows for shelter, have been cited as factors for rattlesnakes to utilize prairie dog towns (Knowles and Knowles 1994). 33. Great Plains Toad. The greater availability and abundance of insects on prairie dog towns, and the availability of prairie dog burrows for shelter, have been cited as factors for this toad to utilize prairie dog towns (Knowles and Knowles 1994). Weighing up to 60 pounds on average, beavers are the largest rodent found in North America. Well-known for building dams, these creatures make more of a difference to their ecosystem than many people realize. In fact, they’re commonly referred to as ecosystem engineers, because of all they do for their surrounding environment. When beavers make a dam, they slow the flow of water in the stream and, subsequently, a pond or area of wetland is formed. Roughly 85 percent off all native North American fauna rely on wetlands, so they’re extremely important to the ecosystem. These wetlands also slow the runoff of rains, thereby storing water that would otherwise be lost. When beavers fell trees to make dams and lodges, they have a positive effect on their ecosystem. After felling aspens — beavers’ tree of choice — the stumps grow new shoots, which are unappetizing to beavers but are the ideal food for moose and elk populations. When they cut down trees, they also bring more light to the forest floor, which allows trees that need a lot of light to grow — such as hazels and alders — an opportunity to thrive. This encourages diversity of plant life. Corona, Lauren. “Importance of Beavers in an Ecosystem.” Animals – mom.me, http://animals.mom.me/importance-beavers-ecosystem-5777.html. Accessed 05 June 2018. So it’s in our best interest to have opossum neighbors. This means keeping their habitat intact with thoughtful land use planning, tolerating them in our yards, and, whenever possible, avoiding opossum collisions. They are beneficial to gardens. By eating snails, slugs, insects, and small rodents, they destroy the true culprits that feed on your beautiful vegetable plants. They clean up spilled garbage. Therefore, if you are too lazy to take your trash to where it belongs and you sit it out on your porch, and then awake to find it gone? Perhaps you should write the opossum a thank you note. They eat spoiled and rotten fruit that has fallen from trees. This will keep other pests, flies, beetles, and creepy crawlers from invading your orchard or lawn. Oh and opossums are very clean, they actually groom themselves meticulously and precisely, much like cats. Opossums are very necessary to the environment and beneficial to our health. Bobcats, scientific name Lynx rufus, are the most widespread predator in North America, ranging from Mexico to Canada. 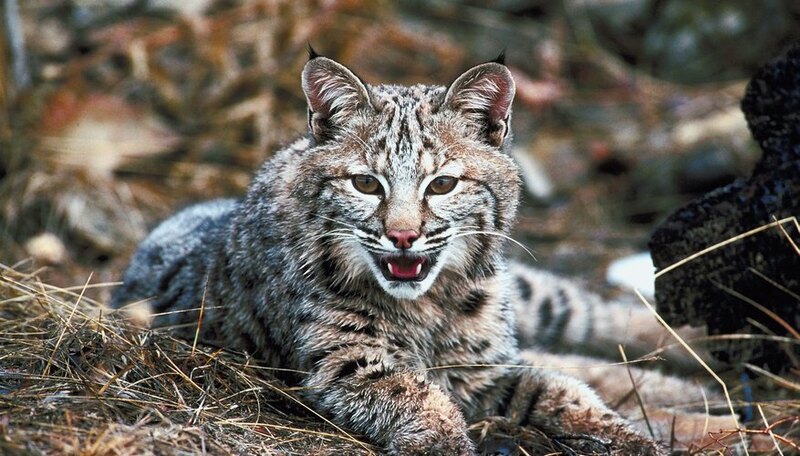 Some researchers have suggested that the bobcat is a “keystone species.” A keystone species is one that has a disproportionate effect on the ecosystem that it lives in, relative to its biomass. Predators are commonly named as keystone species because their populations are relatively sparse, yet they exert considerable influence on lower levels of the food chain. The bobcat is a generalist predator — this means that it has the ability to prey on a diverse range of prey species. This is due, in part, to its versatile size. The bobcat, roughly the same size as a coyote, is big enough to take down small deer and pronghorn antelope, but small and agile enough to capture small prey. A study carried out by Idaho Fish and Game staff, published in a 1988 issue of “Northwest Science,” found that bobcats ate a total of 42 different species within a year in Oregon’s Cascade Ranges. Hares, black-tailed deer and beavers made up the bulk of the annual diet, but bobcats also ate a range of small mammals, birds, reptiles and even insects. As a top predator the bobcat is at, or near, the top of the food chain. This position is a critical one, because the bobcat exerts what is known as “top-down control” of ecosystems. Bobcats and other predators help to keep ecosystems balanced. In ecosystems that are short on predators, consumers lower in the food chain rapidly increase in population size. This over-taxes food resources, leading to poorer condition of individuals and higher rates of starvation. Eventually, low birth rate and high mortality will cause consumer populations to crash, but in the meantime, the effects have filtered down to plant communities. Over-grazing by herbivores can result in very low biomass of some plant species. This in turn affects invertebrate communities, and can inhibit nutrient cycling. Casey on Animal Rescue or Scam?